Grandpa Larry’s Dairy farm is anything but ordinary. Once the cow’s chores are done, they slip through a magical portal to a land where they can play and have fun all day. What is it like on the other side of the portal? Follow the cows through a typical day at Grandpa Larry’s Dairy and find out! Author Lacey Lexvold is a wife and busy mom to three boys, Ryan, Cain and Owen. She is also the owner of Zumbrota Eye Care, a private practice eye clinic in Zumbrota, MN. 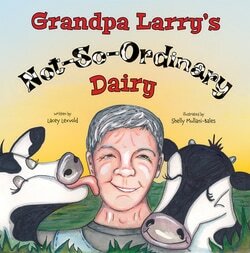 Lacey enjoys children, writing poetry, and country living - the three of which came together in her first book "Grandpa Larry's Not-So-Ordinary Dairy", a playful tribute to her father-in-law's dairy farm.